1- MUSCLE ICE (ACHES & PAINS) - Help ease the discomfort of joint and muscle pain with our convenient Aches and Pains Spray. 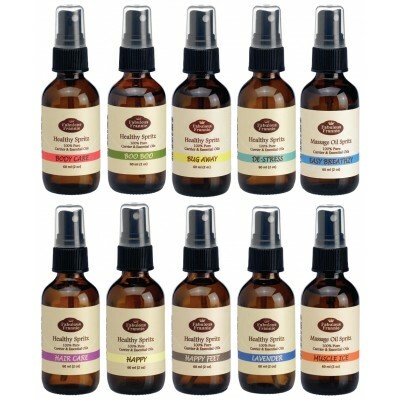 Formulated with pure essential oils naturally high in anti-inflammatory properties and non-comedogenic carrier oils. Ingredients: Grapeseed, Jojoba, Coconut Carrier Oils. Muscle Ice Blend. 2-BODY CARE-Nurture your body with our ultra moisturizing body spray. With its delicate floral and vanilla aroma your skin will appreciate the skin healing properties of the pure essential oils and natural carrier oils. Ingredients: Grapeseed, Apricot, Avocado & Coconut Carrier Oils. Vanilla & Palmarosa Essential Oils. 3-BOO BOO-Formulated with pure essential oils known for their antibacterial and calming nature, Boo Boo Spray will help heal the effects of minor cuts, scrapes and burns. Ingredients: Grapeseed & Coconut Carrier Oils. Tea Tree, Lavender, Chamomile Essential Oils. 4-BUG AWAY-Free yourself from the torment of everyday bugs and biters with our all-natural Bug Away Spray. Formulated with non-comedogenic carrier oils and pure essential oils known for their repellant properties, this spray is a must have for all your outdoor activities. Ingredients: Grapeseed, Jojoba, Coconut Carrier Oils. Bug Away Essential Oil Blend. 5-EASY BREATHZY (COLD & FLU)-Help prevent the cold & flu season from victimizing your household with our all-natural Cold & Flu Spray. This pure essential oil blend is formulated with natural carrier oils and pure essential oils known for their high anti-viral and antibacterial properties. Ingredients: Grapeseed, Jojoba, Coconut Carrier Oils. Easy Breathzy Essential Oil Blend. 6-DE-STRESS-Stress of work, family, home got you down? Help your mind and body relax with our ultra-calming De-stress Spray. Ingredients: Grapeseed, Jojoba, Coconut Carrier Oils. De-Stress Essential Oil Blend. 7-HAIR CARE-Dry brittle hair your battle of the day? Dandruff or itchy scalp got you down? Try our all-natural Hair Spray formulated with pure essential oils for calming, healing and rejuvenating your scalp and natural Argan and Jojoba to moisturize and add sheen! Ingredients: Jojoba, Argan & Coconut Carrier Oils. Rosemary, Lavender and Chamomile Essential Oils. 8-HAPPY HEALTHY FEET-Our easy solution to dry, cracked, feet. Got fungus or Athlete’s foot? We’ve got the answer in an easy to use Spray formulated with natural carrier oils and pure essential oils; designed to heal and moisturize the most overused part of our bodies! Ingredients: Grapeseed, Jojoba, Coconut Carrier Oils. Happy Feet Essential Oil Blend. 9-HAPPY-In need of a little boost of joy? 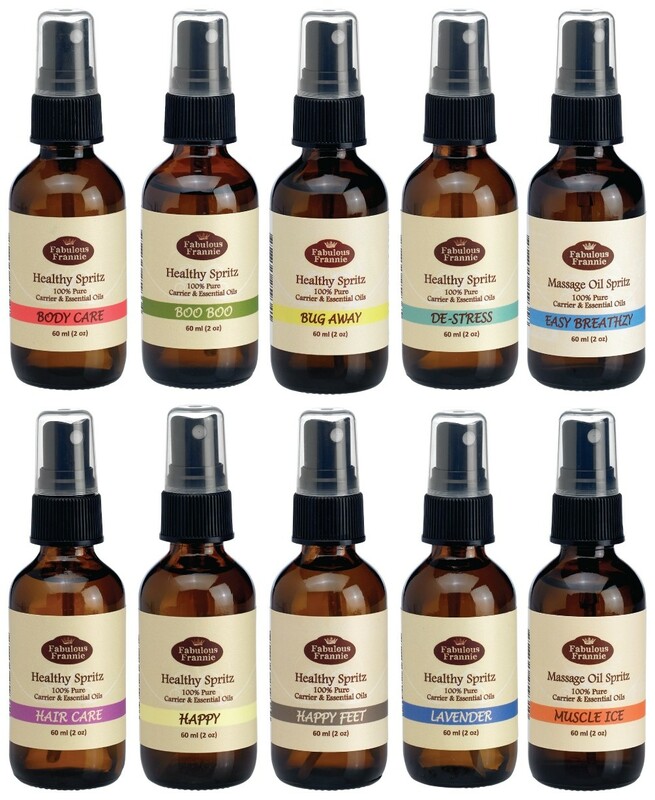 Our Happy Spray is designed to promote feelings of cheer and contentment. Ingredients: Grapeseed, Jojoba, Coconut Carrier Oils. Happy Essential Oil Blend. 10-LAVENDER-Enjoy the benefits of the world’s most popular essential oil in a convenient Spray! This beneficial Spray is formulated with naturally moisturizing carrier oils and pure Lavender essential oil. Ingredients: Grapeseed, Apricot, Avocado & Coconut Carrier Oils. Lavender Essential Oil.